“Looking back, I am not sure I’d even be at the NBA without coach Engles and the relationships I created my senior year." When Edward Jheryl Wilson graduated from NJIT in 2011, he did so in heroic fashion — etching his name in university lore by leading the Highlanders to their first winning season since joining the elite ranks of Division I basketball in 2006 — and becoming NJIT’s first Division I 1,000-point scorer in the process. However, Wilson’s successful journey in top-level athletics was not without adversity from the start, nor would his journey be quite over after he left NJIT. True to his parents’ message, Wilson persevered. His determination would help him grow from an inexperienced 18-year-old kid into a consistent star performer that would more than rise to match the intimidating roar of top-tier NCAA crowds by his senior year. Wilson’s exceptional play marshaling his team’s backcourt as point guard against the Great West Conference would eventually earn him plaudits from national media, attention from sporting agents and even some professional offers overseas after graduation. Though, it wasn’t quite enough to punch a ticket to his dream destination — the NBA. Instead, that ticket would be earned by what Wilson was doing off the court. Wilson’s athletic career provided him an acute understanding of the game he loved between the lines. But it was his off-the-court focus in digital media and communications, and a fortuitous NBA internship with the help from his senior-year coach, Jim Engles, which would give Wilson his start in the professional sports industry and teach him to effectively create content for the NBA’s immense, global digital audience. Wilson would leverage his unique experiences and connections within the NBA’s Business Operations offices to grab the spotlight during his first professional interview shortly after his internship ended in December of 2011. The position: creating and managing digital media content for the NBA. Seven years later in his current role as editor of content production for emerging media at the NBA, Wilson spends busy days working from the league’s leading office for marketing and communications in Secaucus, N.J. — doing everything from editing and producing video compilations of LeBron James’ latest high-flying highlights to attending games and filming the NBA’s star players at courtside for the league’s social media sites. When he’s not creating and strategizing with his office’s content production team alongside prominent NBA production partners like Turner Sports, Wilson also gets to travel to help expand the league’s media presence internationally. Wilson has traveled with production crews for major national events such as the NBA Draft and the NBA All-Star Game, and has worked on media support teams for the league’s major global events, such as the NBA South Africa and NBA Mexico City exhibition games. Along with all the perks, Wilson’s work plays a part in the larger, unparalleled success of a league that is transforming the professional sports industry’s digital media landscape. The NBA’s social media sites — YouTube, Instagram and Twitter — have virtually overtaken all American sports leagues in followers and online engagement. Even the NFL’s 24+ million Twitter followers are overshadowed by the NBA’s 27+ million. Wilson has directly contributed to the league’s success, initiating projects such as the extremely successful NBA History social platform, which Wilson says has already amassed over 3.2 million social media followers across Twitter and Instagram since launching in 2017. The platform features video clips and digital content commemorating the anniversaries of iconic moments in the league’s history. During the month of the NBA Finals, Wilson says he dug up and put together content celebrating Michael Jordan’s buzzer-beating shot against the Utah Jazz in the 1998 NBA Finals, which famously clinched the Chicago Bulls their fourth consecutive title. Wilson says his team holds morning and evening content planning meetings — communicating internally, as well as with their broadcasting partners and the NBA’s offices in Brazil, London, China and India to strategize and find new ways to orchestrate more dynamic, on-demand digital content for its ever-growing millennial and post-millennial fan-base. Despite the immersive, non-stop nature of his job, Wilson says the competitor in him is always seeking the next challenge. 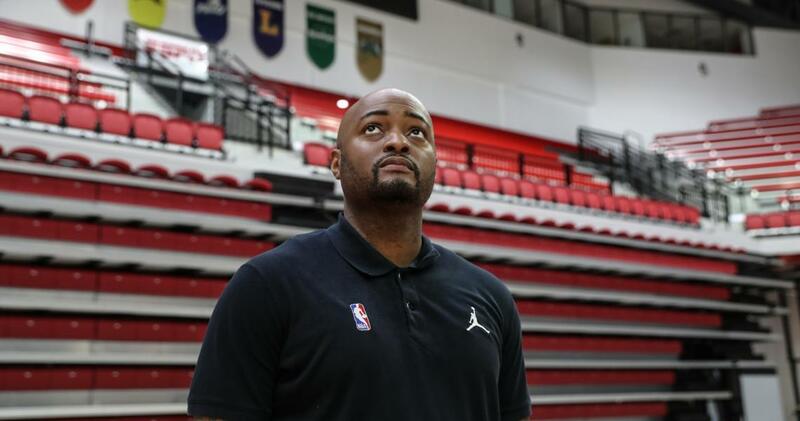 He hopes to transition his experience to either the league’s basketball operations to work more closely with players, or global partnerships operations to further market the game in other countries. Amidst all his past successes and future aspirations, Wilson has not forgotten his playing days or his roots at his alma mater, which has seen its share of transformations seemingly right alongside his own. These days, when Wilson returns to support his college team during each basketball season, he does so among a radiant sea of red stands, press boxes, bright lights and ESPN cameras at NJIT’s sparkling-new 3,500-seat basketball arena inside the Wellness and Events Center. The gloss and grandiosity of the Highlanders’ new home runs in stark contrast to the intimate confines and faded court-wood aesthetic of the former 1,000-seat Estelle and Zoom Fleisher Athletic Center where Wilson once played, grew up and called home only seven years ago. Nevertheless, the new arena is indelibly marked by Wilson’s determination to create a “lasting impression.” There’s a 1,000-point scorer’s banner with his name on it, hanging beneath the arena’s steel rafters.